If there’s one sweet that I crave regularly, it’s brownies. I like them rich, dense, and fudgy. 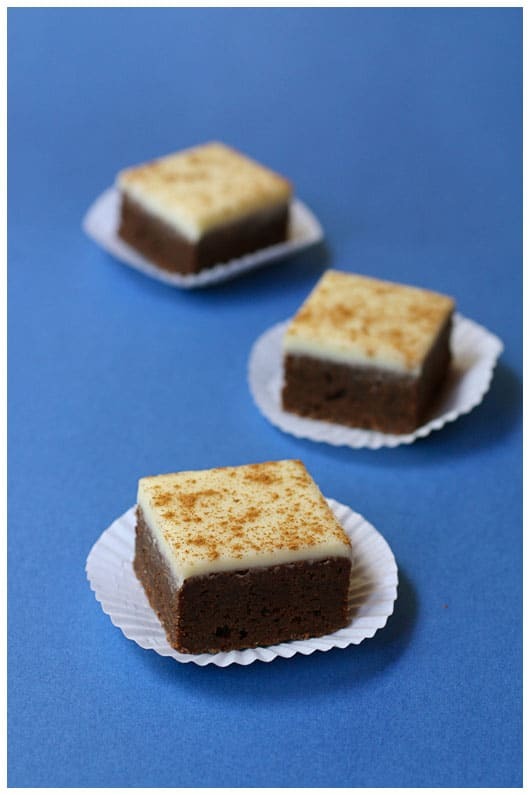 And these Cappuccino Brownies are capital I “Incredible”. I’ve made these a number of times since they first debuted in the Bon Appetit magazine exactly one year ago. The first time was for a dear girlfriend’s birthday lunch celebration. Normally these girlfriends might not even finish a full piece of dessert. But not this time. The brownies were portioned large and every one of us had seconds (or thirds!). They are truly irresistable. 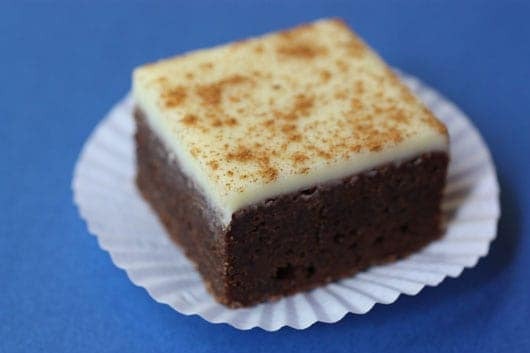 Besides having the perfect brownie base, these beauties are adorned with a lovely white chocolate ganache, a play on the steamed-milk foam atop a cappuccino. Lightly dusted with cinnamon, the sentiment is complete. 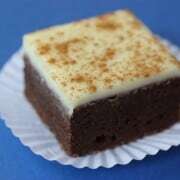 These cappuccino brownies are extraordinary to me, as I truly am not a white chocolate person. I love my chocolate dark. Really dark. And I’m always the first to point out that white chocolate is really not chocolate at all, but a confection of sugar, cocoa butter, and milk solids. But I love these brownies as if my life depended on them. White chocolate and all. Preheat oven to 325°. 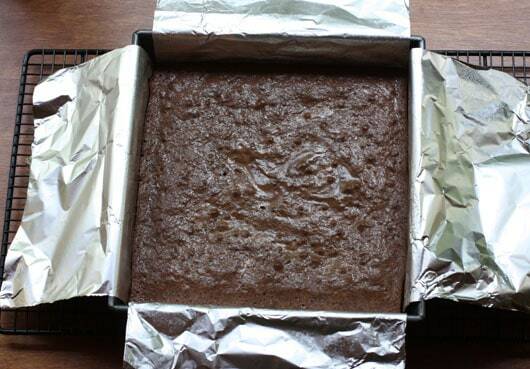 Fold a 16″ long piece of foil to an 8″x16″ strip; place in 8×8 metal baking pan, leaving overhang on 2 sides. Repeat with another sheet of foil in opposite direction, lining pan completely. Spray foil with nonstick spray. Stir butter and chocolate in heavy large saucepan over very low heat until chocolate is melted. Remove from heat; whisk in sugar, then eggs, 1 at a time. Whisk in espresso powder, vanilla, and salt; sift flour over and stir to blend well. Transfer batter to prepared pan. Bake brownies until puffed and dry-looking and tester inserted into center comes out with some moist batter attached, about 30 to 35 minutes. Cool completely in pan on rack. For ganache, place white chocolate in medium microwave-safe bowl. Bring cream to simmer in small saucepan. Pour cream over chocolate in bowl. Let stand 30 seconds, then stir until chocolate is melted and smooth. 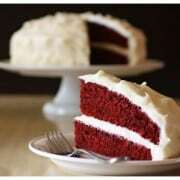 If necessary, microwave on low power in 10-second intervals until white chocolate is melted completely. Don’t overheat. Chill until ganache is thick but still slightly pourable, about 25 minutes. Using foil as aid, lift brownies from pan. Turn over onto sheet of parchment paper; peel of foil. Pour ganache onto center of brownies; spread to edges (some may drip over). Sprinkle lightly with cinnamon. Chill until ganache is set, at least 2 hours. Cut and serve. I don’t know what happened to my 8X8 pan. It’s taken a hike, probably when my son moved out. So I simply used my 9″ cake round. What the heck, right? And then I used a cookie cutter to make shaped brownies. And ate the leftover pieces. Hey–I’m the cook. I get to do that! The ganache and cinnamon are what makes them incredible in my opinion. I thought I wouldn’t like them without the espresso, but both were equally good. YUM! Thanks Brenda! I know very well that tummy ache you’re talking about!! I can’t promise you anything, but I think it would be worth a try in a 9×13. 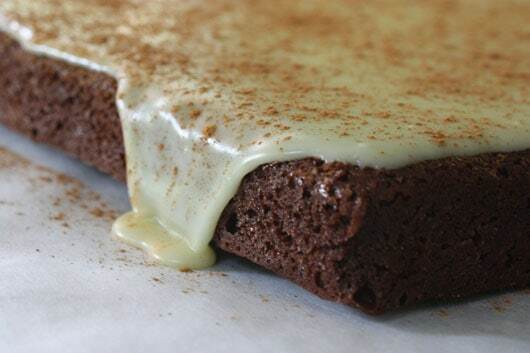 You’ll probably have a slightly thicker brownie, but that’s an ok thing! I don’t see an issue with them coming out of the pan – they lift out very nicely with the tin foil. Take note of the baking time and report back, please! It would be great to have a larger size option, as they disappear all too quickly. These made me SO happy! Thanks Brenda! After we tried them last winter…I made them myself and they turned out awesome! Definitely my favorite chocolate dessert. (I even had them instead of my morning coffee) I love, love, love them! Just added the cappuccino brownie recipe to my plans for the week! They look delish! I cannot wait to try them. Sara – these will more than fulfill your tasty summer eating adventures, might even cover your adventures for a few days, they’re that good! You just described my most favorite brownie; rich, dense and fudgy. I’ve never been able to make one from scratch that has come out that way, but this one looks like it would be perfect. Not to mention chocolate AND espresso together! I’m adding this to my list of things to try, and this may just make it right up closer to the top since I’ve had a craving for something chocolate and rich. Very good! Very good! 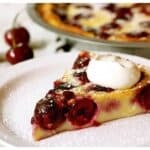 This is a perfect meal-ender in the heat of summer…fills the dessert and coffee cravings! These brownies were the perfect way to finish off our meal while camping last weekend. Thanks for bringing them. So-o-o good!! So this might be my most favorite thing Brenda has ever made!! Make them. Make them now! Make many. Share!